The new rules you need to know to build a totally kickass resume. My daughter Alexandra is graduated from college this year, which can be exciting and terrifying all at once. When she asked me to help her with her resume, I panicked. Everything I thought I knew about resumes was so out of date in an algorithm-search job hunt. And so we made the decision to get her a unique sort of gift, and it was one of the best decisions we’ve ever made. Her gift was time with a rockstar career coach, who helped my daughter design her resume. The coach was Crystal Olivarria, someone who is dedicated to helping people find their future in a career that is relevant, fun, fulfilling, and financially rewarding. To make all of those things a real possibility, you need to have a kickass resume. So she and Alexandra set out on a journey to design an amazing piece of paper that somehow embodied my daughter. Because, even though you aren’t that piece of paper, to that hiring manager reading your resume, you are that piece of paper. I honestly could not believe the amount of progress they made in such a short period of time, and this reminded me of something very important. There are field experts for a reason. Crystal made my daughter’s resume process more efficient, more savvy, and more fulfilling because every step of the way, she was learning something new about how she should represent herself now, and it was all so relevant and fresh. Expert Tip: Subscribe to industry trade magazines to stay up-to-date on what’s happening in your industry, who’s making the news, and what’s new in the field. 1) Build your network faster, within your industry. 2) Import your info into resumes online quickly. Are Cover Letters Still A Thing? YES! Cover letters show professionalism, maturity, and also that you cared enough to take the extra step. A lot of people skip this step, and so this is one simple way you can really stand out. A cover letter completes your profile, and your resume package, and without it, your resume will seem a bit naked. The thing about a cover letter is that it has to be personal to the company you are interested in, and it needs to briefly answer a few questions for whomever is reading. 1) Why are you a good fit? 2) How can you add value? 3) How are you already invested in the mission of the company? 4) How can you contribute to furthering that mission? This means you’ll have to do your research (maybe mention a tidbit from a recent press release) but I can guarantee that time spent will be appreciated. Your resume can be a black hole of time spent staring at the computer screen, especially when it comes to the cover letter. So use the criteria above, and spend your time researching your potential employer instead. Expert Tip: Anytime you get recognition for anything at all, an award, honor roll, etc. keep track of it, snap a picture and put it on social media (employers research profiles now). This shows potential employers, in a more enigmatic way than just a bullet point, who you are, what you celebrate, and that you’re a real person who gives a damn. At some point during this process, my daughter experienced a shift. 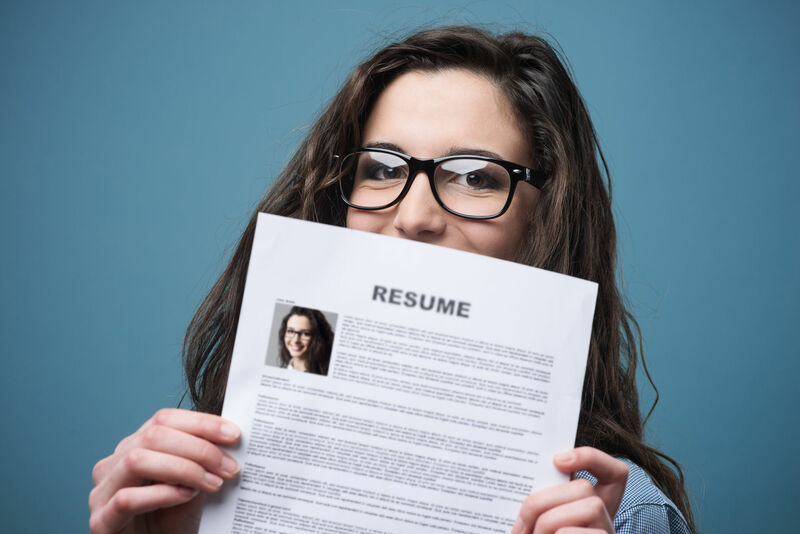 She went from fretting about not having enough job experience to highlight on her resume (hello, recent grad, new to the workforce) to making sure her resume highlighted her. Hiring a career coach, like Crystal Olivarria, to revamp my college graduate’s resume was the best investment I’ve made in such a long time, for both my daughter and myself. Because now I know she has a foundation to stand on, to go out there and get what she wants from the world, and we all know that an empowered woman, is unstoppable. Tracy is co-host of three podcasts, Feed Your Brand, Product Launch Hazzards & the WTFFF?! 3D Printing podcast. As an innovation expert, ghost designer & product strategist for 250+ branded products generating over $2 Billion at retail, she works with design-leading brands, entrepreneurial start-ups, speakers, and authors to Brandcast their original voice, message and products to the world. Employers Reject Resumes: Why You Should Stop Sending Them.